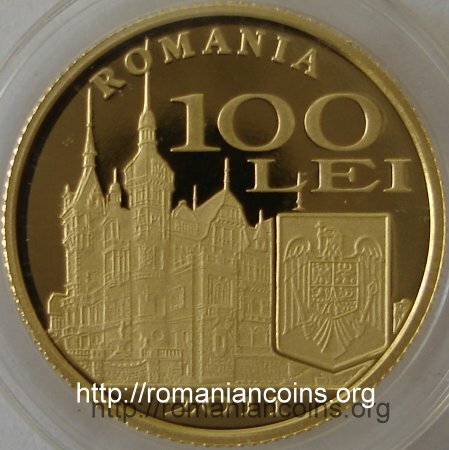 Obverse: ROMANIA, face value "100 LEI", coat of arms of Romania, year 2011, an image of the Peleş Castle from Sinaia Reverse: the first coat of arms of the Kingdom of Romania (model of year 1872, with modifications made in 1881: the crown replaced by the Steel Crown of king Carol, the Order of the Star of Romania under the motto, the lion supporters with erect tails), bust of king Carol, the signature of the king and inscription "10 MAI 1881" meaning "10th of MAY" above, circular inscription "130 ANI PROCLAMAREA REGATULUI ROMANIEI" meaning "130 YEARS PROCLAMATION OF THE KINGDOM OF ROMANIA"
"Article 1. Romania takes the title of Kingdom. 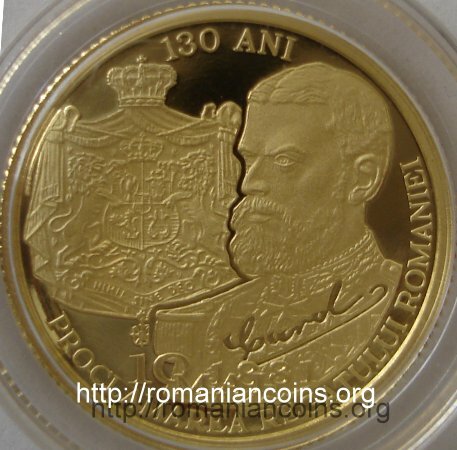 His Ruler, CAROL I, takes for Himself and for His heirs the title of King of Romania. Article 2. The heir of the Throne will bear the title of Royal Prince." The session of the Assembly of Deputies had begun at 14 o'clock, the session of the Senate half an hour later. At 18 o'clock both legislative chambers of the country came to the Palace, where Carol I signed the decree for sanctioning the law. At the request of the Romanian Academy king Carol donated the inkpot and the pen - that had already become historical objects by the act of having been used for signing the law of proclamation of the kingdom. On 10th / 22th of May 1881 the ceremony of the crowning of their majesties the king and the queen took place, and also the feast of the crowning. In the evening of 9th of May the crown of the king and the one of the queen were taken to the Metropolitan Cathedral. The next day at noon the crowns were blessed by the metropolitans and bishops, the moment being saluted with an 101-gun fire salute. Then the crowns were brought at the Cotroceni Palace by four generals, escorted by a huge cortege as honor guard (veterans from 1848, former members of the Ad-hoc Divans, wounded of the Independence War of 1877-1878, members of the Academy, rectors and deans from the universities of Iaşi and Bucharest etc.). King Carol took the Steel Crown and put it above his head, saying: „[...] So I receive with proud, as symbol of the independence and of the strength of Romania, this Crown, cut from a cannon sprinkled with the blood of our braves, blessed by the Church. [...] But for the Queen and for Myself, the most beautiful Crown is and remains the love and confidence of the people, for which we have only one thought: their glory and hapiness. [...] Long live our beloved Romania, today crowned through her civic and military virtues!". A parade of the delegates of the counties and communes took place in the enthusiastic atmosphere - almost 4000 men from the entire country passed before the throne. In the evening the king and the queen made a carriage walk through the city, that was magnificently adorned and illuminated for the feast. On 11th of May the king and the queen received a parade of 45 allegorical floats, representing the agriculture, the National Theater, the commerce, the new regularized bed of Dîmboviţa River etc.. The bakers, the Russian hackney carriage coachmen, the Grand Masonic Lodge of Romania, the Shooting society, Oppler and Luther breweries, the Gaseous Beverage Factory, the Red Cross Society, the tanners and others, participated to the parade with their own floats. The military parade took place on the 13th of May - because 12th of May was a very rainy day. We quote from the inauguration document of the castle, read on October 7th 1883 to the royal family: "I Carol I Prince and King and Elisabeth Queen. After two years of unrelenting endeavor struggling with an unstable realm crossed by springs, we have managed to put at the foot of the Bucegi Mountains the foundation of this building, in the year of salvation 1875, and of our reign the 9th. The construction was stopped in the times of the War for the Independence of Romania. We entered in this house of ours in the year of salvation 1883, and of our reign the 17th. We gave it the name of castle of Peleş." 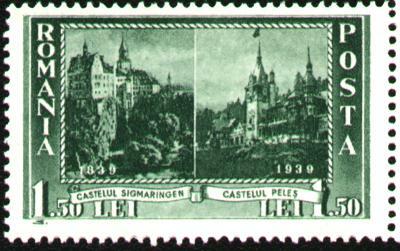 You can see inside the picture at right castle Peleş from Sinaia and castle Sigmaringen as well, at left (Romanian stamp from 1939). The information above were quoted from Bucharest of Yore 1878 - 1884 [Bucureştii de altădată] by Constantin Bacalbaşa (Editura Eminescu, 1993) and from the appendix of the book that reproduces contemporary texts of the Official Gazette [Monitorul Oficial] and from volume "Documents Regarding the Proclamation of the Romanian Kingdom and the Crowning Ceremony of TRH King and Queen" (Bucharest, Printing House Thiel & Weiss, 1882) ["Actele privitoare la proclamarea Regatului Român şi ceremonia încoronării MM.LL. Regelui şi Reginei" (Bucureşti, Tipografia Thiel & Weiss, 1882)].